Here at The Fire Pit Gallery, we believe many of the activities that can be enjoyed indoors with family and friends can also be enjoyed outdoors, especially around a warm fire. Which reminds us, fire is essential to cooking. Although you cannot cook or grill food with one of our artistic fire pit spheres, you can still enjoy any of these 10 recipes the next time you spend time around a campfire. 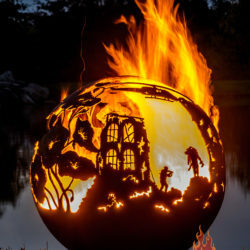 You can’t cook on our unique fire pit sphere, but you can roast with them. Using a roasting stick, you can put together a campfire classic: the s’more. With the roasting stick, roast a marshmallow to your preference and then sandwich it with a piece of chocolate between two graham crackers. If you are hungry for just a snack, popcorn is something quick and easy you can make around an open fire. 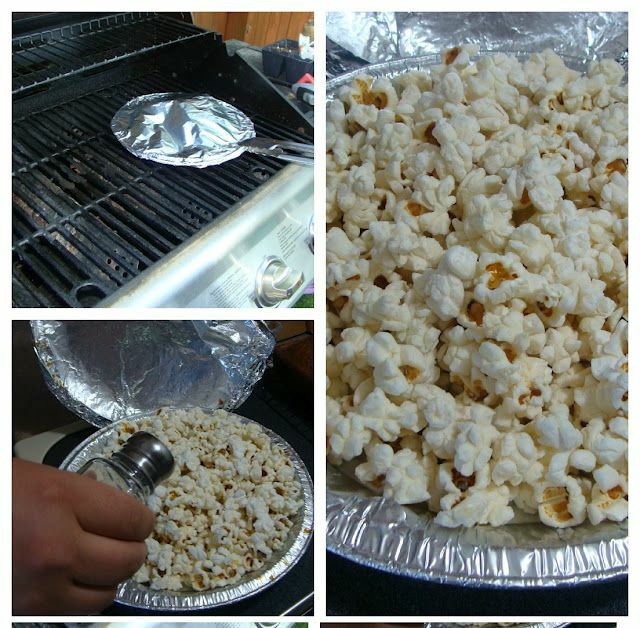 For this recipe, you will simply need a disposable pie pan, ¼ cup of popcorn kernels, 1 tablespoon of vegetable oil, aluminum foil, and if desired, salt and butter for seasoning. Who needs the microwave when you can make popcorn this easy and fun way? 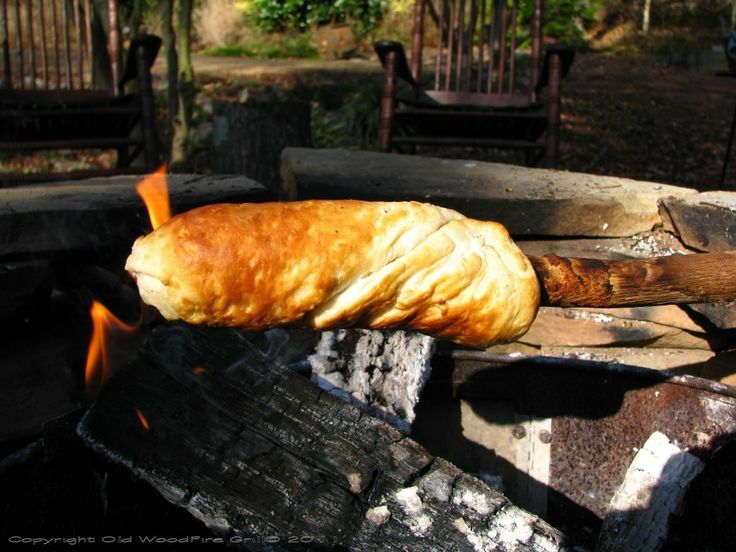 This easy campfire food recipe only requires canned biscuits and a hardwood stick about 1-1/12 to 2 -1/2 in. in diameter (or if you want to make little biscuits, you can always use a roasting stick). Just place the biscuit dough over your open fire until it’s crispy. If you choose to roast it with a hardwood stick, you can always fill the biscuits with eggs, cheese or PB&J. With the roasting stick route, you can dip them in Nutella or eat them as they are. You will need a pie iron for this recipe. Just like regular French toast, dip your slice of bread in your egg batter and place it in a buttered pie iron. Toast the bread on open fire until bread has browned. Remember, you always have the option to stuff your French toast with jam (or your spread of preference) for enhanced flavor. This is a delicious way to make a warm sandwich for your friends and family. Essentially, you need a 10-to-12-in. 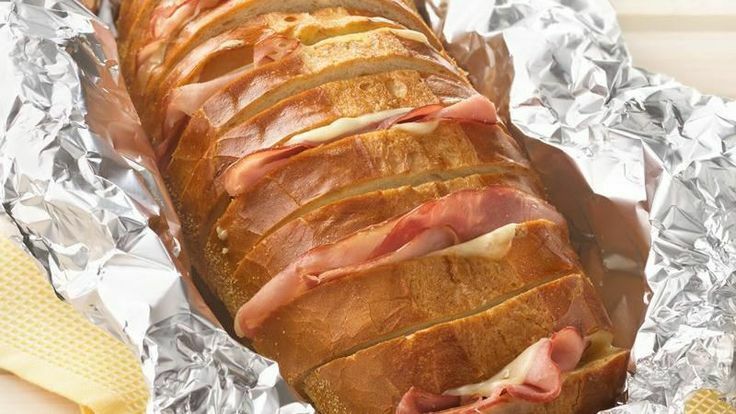 long Italian loaf, butter, Dijon mustard, Swiss cheese, ham, aluminum foil and cooking spray. This campfire food recipe is perfect for a casual lunch or outdoor dinner. 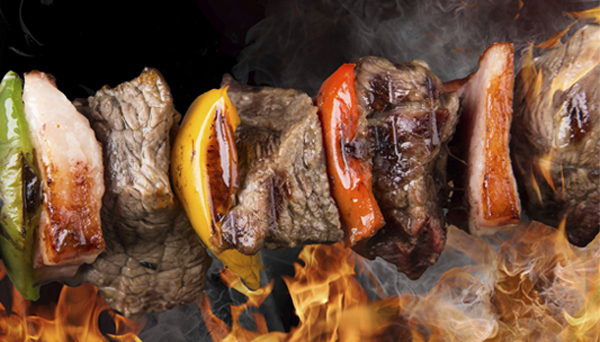 Healthy and easy to prepare, kabobs are prime campfire food. While ingredients may vary (some people may prefer chicken over beef, or veggies over meat altogether), some items like skewers and aluminum foil are always needed. Veggies that are generally used all the time in kabobs are onions, bell peppers, zucchini and mushrooms. Here’s an example of a kabob recipe you can follow. This is another simple recipe that will require a pie iron. Just like you would prepare any tuna or cheese melt, put the bread and filling together, place it in the pie iron and let the sandwich grill until the cheese has melted and the bread is toasted. As with any burrito, prepare and gather your meat of preference (or veggies if you or a friend is a vegetarian), rice, cheese, salsa, beans and large flour tortillas. 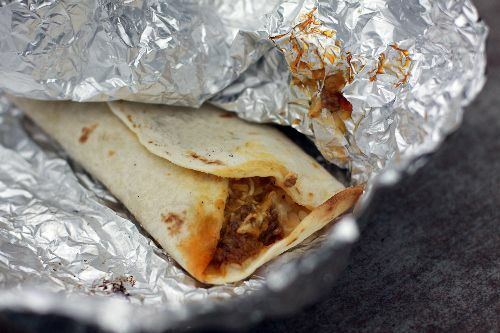 In addition, you will need aluminum foil to wrap the burrito while it toasts in your campfire. For a specific recipe, you can check this one out. This quick and easy dessert will surely make your family and friends want second and third servings. You will only need aluminum foil, pineapple rings, butter, brown sugar and a simple cake donut. Five to seven minutes after putting the ingredients together and wrapping it in the foil, you and your company will be enjoying a delicious sweet. Did you know you can also bake over an open fire? For those dessert lovers, you’re in for a treat! Cut off the top of an orange and scoop the insides until all you have left is the orange peel in the shape of a small bowl. Prepare some cake mix and start pouring the mix in the small orange peel bowl. 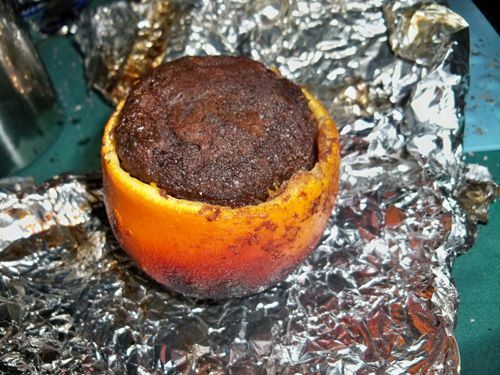 Then, wrap this with aluminum foil and set the orange in campfire coals for about 20 minutes. Delicious, right? What recipe will you be preparing first? Are there any other foods you prepare over open fire while camping? Share them with us!